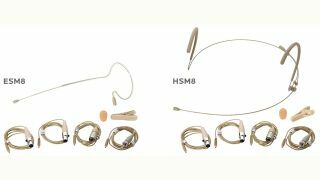 Galaxy Audio’s super-lightweight wireless headset microphones, the ESM3 and ESM8 single-ear and HSM3 and HSM8 dual-ear headset microphones now come with four free Easy Replace Cables. Five prepackaged bonus packs will be available with four Galaxy Audio/AKG cables, four Shure cables, four Audio-Technica cables, four Sennheiser cables, or a mixed set with one each of the four available cable brands included. Each headset mic also includes a windscreen and convenient black storage case. Detachable cables are available in configurations for Galaxy Audio/AKG, Shure, Audio-Technica, and Sennheiser. Galaxy Audio can also custom make wire to work with virtually any brand or model of wireless transmitter.